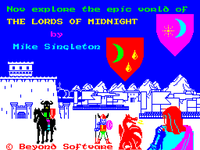 The game is released in 1984 for the ZX Spectrum. It is a strategy/adventure game. The player starts with four characters (Luxor the Moonprince, Rorthron the Wise, Corleth the Fey, and Morkin), and then has the option to recruit up to twenty eight further Lords to the cause in the quest to destroy Doomdark, the Witchking of Midnight. The game can be played in two ways: 1) as an adventure game, where the focus is on Morkin's quest to destroy the Ice Crown; 2) as a wargame, where the focus is on recruiting lords and troops to defeat Doomdark's armies. Source: Wikipedia, "The_Lords_of_Midnight," available under the CC-BY-SA License.